Rivers of Light Opens! Was it Worth the Wait? Tonight Disney had a last minute (as in the fastpasses were put out this morning) passholder preview for their new Rivers of Light show at Animal Kingdom. This show has been much anticipated and delayed several times, so the build up has been pretty big. So was Rivers of Light worth the wait? In a word, YES. It really was. Rivers of light was truly a breathtaking show. It’s like a moving painting of light and water. One of the most visually stunning shoes I think Disney has ever produced. Let me tell you- if you are a fan of illuminations at Epcot then you will love Rivers of Light. It has a very similar feel to Illuminations and the overall message of seeing the bigger picture and being a part of a global family is very similar. The soundtrack was probably my favorite part of the show. It has an epic quality to it with a strong emotional pull. I’m really hoping Disney releases it for purchase because I would buy it in a heartbeat. As you can imagine with the name, the show takes place on water. There are floating barges that freely move out on the water. Some are in animal shapes and some are huge gorgeous lotus flowers. All of the floats change colors often and the flowers have fountains of water that move in artful shapes during the show. There are projections of animals that are shown on sprays of water similar to the kind used in Fantasmic. There are two large boats that each have a pair of performers who play a sort of “host” to the show. The way they use the shadows behind the performers on the sails of the boat is truly unique. There were several times that the movements that they did were echoed in the projections and the water fountains. The show isn’t restricted to what is happening on the water. Before the show even begins the lighting around the water begins to change. Movements of animals are seeing in the trees. Fireflies are lighting up the greenery around the water and the tree of life is lit throughout to reflect what is happening during the show. All of that combined with spotlights, music and sound effects create an immersive atmosphere that really adds to the show experience. In adding Rivers of Light to your animal kingdom day visit I would suggest you do get a fast pass for the show, at least at this stage when it’s so new. I normally don’t recommend using fast passes for shows since it’s not usually difficult to get a seat but until this one has been around a little longer getting a fast pass would be best so that you know you have a seat. Fast pass entry is on the side closest to Everest. Standby entry is just past Dinoland. Beginning March 12, showtimes change to 8:45 p.m. on Sundays, Tuesdays, Thursdays, and Saturdays. That lasts through April 8. 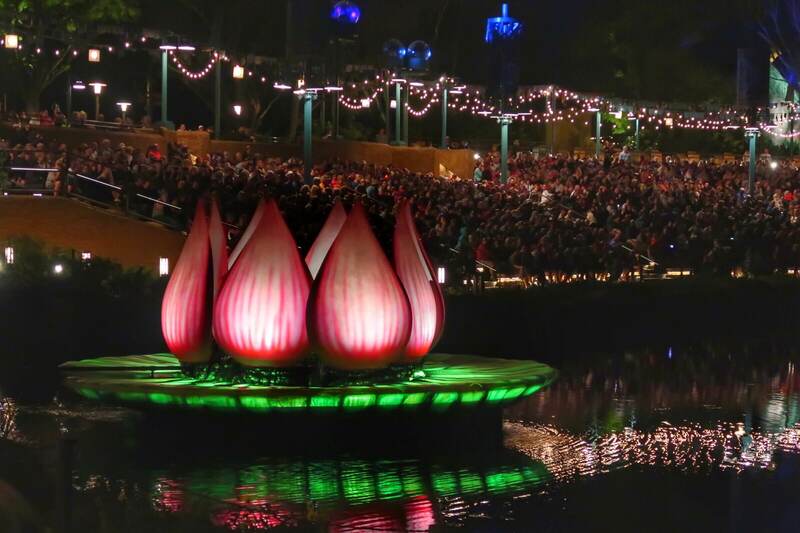 Beginning April 9, Rivers of Light will have two shows each and every night – one at 8:30 p.m. and one at 9:45 p.m. leading up to the Easter holiday. Starting April 23, the park will go back to having only one showing nightly at 8:45 p.m. The final schedule change will begin April 30, when Rivers of Light will take place beginning at 9:30 p.m. each evening. So basically, just check during your trip to see when it will be playing and plan your Animal Kingdom visit accordingly. I’m betting that the days when Rivers of Light is scheduled will mean higher crowd levels for Animal Kingdom, so keep that in mind when you plan. Since AK usually doesn’t have a huge crowd problem I personally wouldn’t worry too much about that. This fastpass will go quickly as soon as the window opens for booking so get it soon. I hope you like it as much as I did!